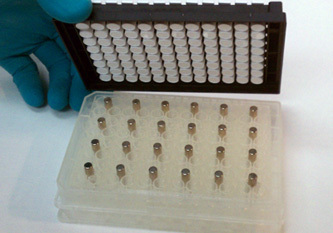 We provide 3 types of inexpensive, lightweight and sturdy Magnetic Separation Racks for 96 well microplates. 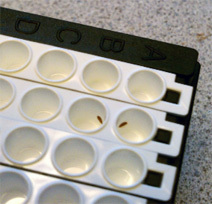 9624H is shown in figure 1a with a black-frame / white-strip microplate that allows the longer and higher magnets to fit in between a group of four adjacent wells (figures 1b and 1c). The PMPs are quickly drawn to the magnet in the center of four wells leaving the collection of these particles packed onto the side of the wells so the assay and wash buffers can be removed by aspiration or decantation (slapping). Unlike other magnets these Neodymium magnets do not lose strength when jarred and are the strongest available. The PMPs are packed onto the side wells, but easily resuspend in wash buffer. 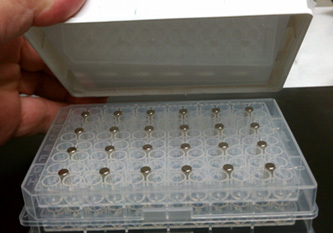 The configuration of the magnets in 9624L (figure 2) is the same except that they are shorter and rise just above the holder plates so they can come into contact with the flat bottom of solid microplates. The PMPs are pulled to the bottom corner of the wells leaving the center of the wells clear for aspiration without disturbing the PMPs. 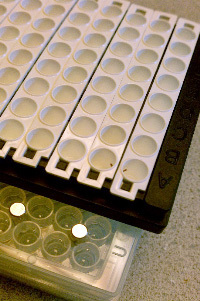 The PCR plate nestles perfectly into the added third layer of 9624HP (figure 3). The magnetic particles attach to the inner sides of the wells allowing them to avoid aspiration. A circular, vibratory mixer like the one shown in figure 4 works well to resuspend the PMPs in wash solution. The process takes seconds for each cycle and no expensive plate washers are required. 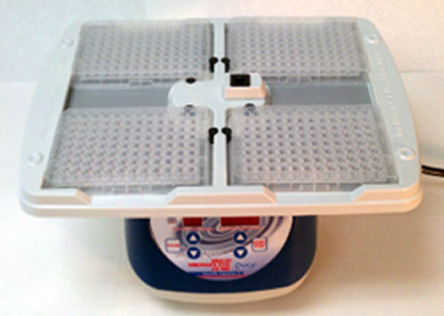 A SMI digital mixing platform is capable of holding 4 or 8 microplates. 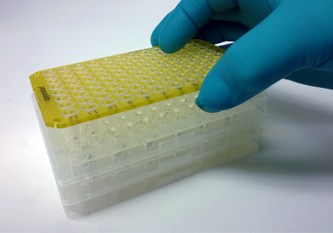 Our MicroPlate Magnetic Separation Racks are available for purchase HERE.